My husband's company party is in a few weeks and represents a rare opportunity for me to get to play dress up (which is basically my favorite thing to do ever). It's formal attire (cocktail dress/gown for ladies, dark suit/tux for boys) and it's going to be a MOTHEREFFING MASQUERADE BALL which I'm sure only I am excited about. And I just can't find a freaking dress that I like. Maybe something like this, but a little less Designing Women? Double points for anything in animal print. And I'm not opposed to a very pouffy skirt either. I'm willing to accept the fact that my tastes run a little grandma-lives-in-Miami-and-hasn't-abandoned-the-80's-yet if it means I can find something I feel and look awesome in. Oh and I have short, asymmetrical-ish hair and I wear big earrings with everything. You guys up for more shopping?? That Alice & Olivia is here in a L.
YES! Get the A&O, OP! LOVE the black/gold chevron dress! 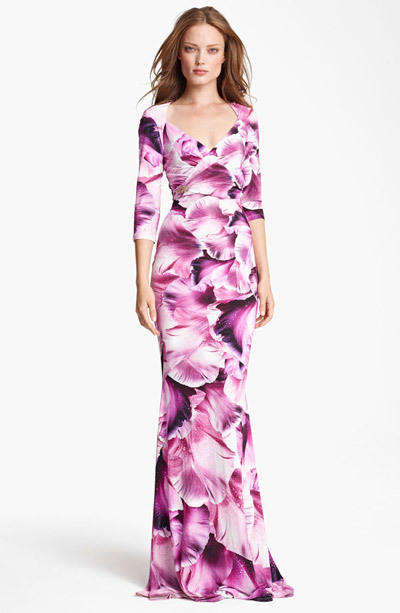 her floor-length options are few and far between, but i can't help feeling like you should be going with DVF for something like this; the sleeves and wrap form would suit your body type. There are several floor length options available now. That was in response to Lauren's comment about long DVF dresses. This is has been one of the more challenging ESB shopping requests! So,how do you feel about sparkles? This Roberto Cavalli is 60% off (still over budget), but gorgeous and bra-friendly if you decide to splurge. I've personally never used Rent the Runway, but it might be a good option here. I suspect this Issa would be slammin' on you! That Issa is awesome. You can also look at the dress on other renters, so you can see what it looks like on someone in a similar size with a similar body type. I love that freaking feature. Ditto. The Issa is also here in mint green. But A) not available in her size and B) $750. Issa's site has it in navy, but A) not available in her size B) they only ship within Europe and C) £660. I'd channel this look and opt for something black and sheer. Erin Fetherston has some pretty options, like this one, or, if you go for a short dress, this one. ooh... I love both of these. 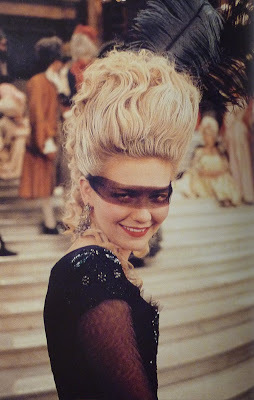 Was also thinking of Marie Antoinette to begin with, and these are so that. Not long sleeves, but I'm digging this all-out sequin number from Michael Kors. Want to go for an 80's office party vibe?